Ok. #worldpearlsareforever is going to continue. First of all not with traveling. But in writing the blog. Are you going to Hongkong for business or pleasure travel? Try out the new best restaurants for 2016: Bibo, Koko, Mercedes Me, Beefbar, Le Garcon Saigon, Vea, The Ocean, Almas im Ritz Carlton, Mr and Mrs Fox, The Fat Pig, Viet Kitchen, Tri (Shop 302, 3/F, Lobby C The Pulse, Repulse Bay, Hong Kong +852 2515 0577) and El Mercado. Unsatisfactory? Looking for more yummy local food, than check this out: Hongkong’s Top 10 Hidden Street Food Items – that’s real Hongkong, too! With 3,420 licensed “light refreshment restaurants,” or snack stalls in the city, Hongkong has a range of unique street food that’s a challenge to find anywhere else in the world. 1. Sweetheart cake (老婆餅): Obviously a sweet pastry, sweetheart cake (or lo por bang, meaning „wife cake“ if translated literally) is a round cake wrapped with a layer of puff pastry with a paste made of winter melon as filling. It has a few interesting tales behind the name: Legend has it there was a poor couple who loved each other very much. But then, the husband’s father became very sick and the wife had to sell herself as a slave in exchange for the money to buy medicine for her in-law. The husband, trying to save his wife, created this cake dedicated to her in order to earn money to buy her back. 2. But zai gou (缽仔糕): This palm sized pudding cake is Hongkong’s equivalent to cup cakes. Molded and served usually in a little porcelain bowl (hence the name “put chai”), this steamed rice cake is made from either white or brown sugar, and red beans. It has a chewy and sticky texture. 3. Bak tong gou (白糖糕): Made with white sugar (bak tong) and rice flour, this traditional snack was created from a fluke back in Ming Dynasty, when a street hawker tried to make sponge cakes but accidentally made this clear, moist and fluffy pastry. It’s usually sold as an individual square piece or a mini triangle, as opposed to the usual circular round cake. 4. Tong chung bang (糖蔥餅): Carried around by street hawkers in a transparent metal box, this sweet snack is served a-la-minute: by wrapping candy wafer, shredded coconut, maltose and sesame with thin crepe pancakes. A bite into a piece of that will have two contrasting textures, with flavor from the coconut popping out. 5. Black sesame roll (芝麻卷): Perfect for the summer, this cool dessert is made of, you guessed it, black sesame by drying a thin layer of sesame paste and refrigerating it. The sheet is then rolled up into a sesame roll, and is often referred to as film cartridges because of the resemblance. 6. Ding Ding Tong (叮叮糖): A candy originated from Hong Kong, ding ding tong gets its name from the “ding ding” sound when hawkers break the hard maltose candy into smaller pieces when selling to patrons on the street. Traditional flavors include sesame and ginger, while more new flavors like strawberry and chocolate are now available to cater to young people’s tastes. 7. Stuffed three treasures (煎釀三寶): Available alongside fishballs and siu mais around town, you can detect the smell of this fried snack from a block away. The three treasures are bell pepper, eggplant and tofu, which are stuffed with a carp fish paste and deep-fried. Other options include mushroom, bitter gourd and sausage for hungry patrons to pick and mix. 8. Lettuce and carp fish soup (生菜魚肉): You may know about fake shark’s fin soup, but have you tried its sister snack? A common Hong Kong street food item in the 60s, 70s and 80s, this easy-to-make snack is pretty much self-explanatory: a soup that’s made with shredded lettuce and slices of carp fish paste, and seasoned with sesame oil and ground pepper. Can’t decide on which soup to get? 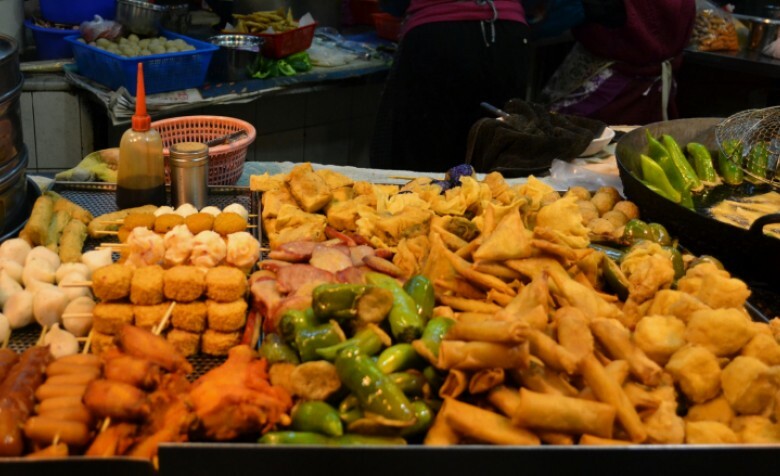 Mix them up: Many snack stalls mix the two soups together for those who want a taste of both. 9. Deep-fried pig’s intestine (炸大腸): Before you scream “yuck!” and get all grossed out, let us remind you: pig’s intestine is actually a pretty common ingredient in Chinese cuisine. You can easily spot someone holding a skewer of these outside most snack stalls in town. Of course, they are well-rinsed and cleaned before deep-fried, and are crispy on the outside and soft and moist on the inside. 10. Sang Cheung (生腸): Ever seen curly orange items on the street resembling intestines and wondered what they are? These bright little delicacies are actually a pig’s uterus (cue gasp). Brined in lo shui (a type of stock), they are usually eaten with mustard and hoisin sauce, and have a chew texture.